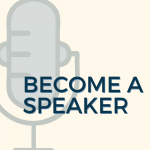 Interested in having a Florida Bar speaker talk to your group? Request a Speaker on Benchmarks (Adult Civic Education) for your group! “Benchmarks: Raising the Bar on Civics Education” offers attorneys presentations about government and the courts that they can use when speaking to adult civic groups. This is a critical mission for The Florida Bar. An informed public is the best defense of a vigorous democracy, the rule of law and a fair and impartial judiciary. Overviews and supporting materials are online, grouped by: Constitution and the Bill of Rights; Courts and the Judicial Branch; and Special Topics. Attorneys who take the training – by watching the webinar or attending seminars that are held locally and in conjunction with Bar meetings – are eligible to make Benchmarks presentations. Presenters can earn one ethics credit hour for each presentation for up to three presentations in a three-year reporting period. The Speakers Bureau exists to promote among Florida citizens an understanding of our constitutionally based system of government, knowledge about the justice system and an appreciation of the role lawyers play to protect the rights of all. There is no fee for this service! Help us spread the word about the Speakers Bureau. 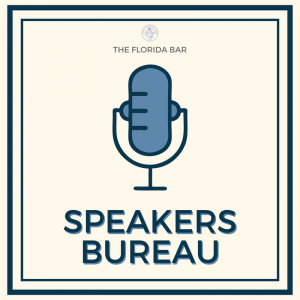 The Florida Bar Speakers Bureau offers schools, businesses, community groups and organizations the opportunity to have experienced attorneys speak about the role of lawyers, the significance of Florida’s constitution and its revision and threats to the U.S. justice system — among other legal topics. For assistance call (850) 561-5701 or email [email protected]. We want to hear from you to improve our services. Please send us a feedback report form about your presentation. 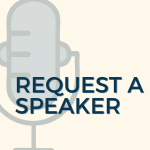 We are always looking for more dedicated attorney volunteers for our Speakers Bureau! No open speaking requests at the moment. If you or someone you know are able to take any of these engagements, please email [email protected]. 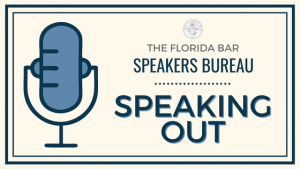 The Speaking Out blog is dedicated to the interaction and education of volunteer speaker members of The Florida Bar Speakers Bureau. Submit items of interest to Dorohn A. Frazier at [email protected], or mail to The Florida Bar Speakers Bureau, 651 E. Jefferson Street, Tallahassee, FL 32399-2300. Photos sent by email should be in jpg or gif format. The guide is a collaborative project of the Supreme Court of Florida and FLREA.